Will WD-40 Damage Car Paint? Not to honk my own horn here, but I bought my first car myself when I was 21 years old. It was a nice car too: a BMW 2 Series Coupe. I had been working since I was 15 years old, and I saved any penny I could from each paycheck. I was ecstatic to be able to walk into the dealership one day and purchase my shiny, black baby. That being said, you would be terribly mistaken to think for a second that I didn’t take care of this car as if it were my child. I drove her so carefully and paid such meticulous attention to the road, that I would wait until I was at a stoplight to simply change the radio volume. I was careful about where to park her, and I purchased the unlimited car wash membership too. I didn’t mean to be so pretentious about it, but after working so hard to earn the car, I wanted to preserve it as best I could. The day came that I was forced to park my car underneath a tree. The weather was fair and it wasn’t fall yet, so there was no risk of branches, big or small, crashing down. When I came back to my car; however, I did find a nice smear of what looked like a child’s handprint down the driver’s side. What a plot twist, right? Whether it was the sticky remains of a popsicle, or boogers, I didn’t want to spend more money on a car wash, given that I had just purchased one a couple of days ago. I figured there had to be something that had a specific purpose of spot-removing sticky substances and stains from cars, so I drove to the local auto-parts store. Why did a six-year-old see my car and feel the need to finger-paint the side of it with some sticky goo? The world may never know. This car is a work of art without that, thank you very much. Nonetheless, kids are kids. At the counter, I explained to the cashier what happened and he reassured me that WD-40 would do the trick, and retrieved it from the shelf for me. He said that after I applied it, just to let it sit for a couple of minutes, and then wipe it clean with a soft towel. I knew that WD-40 was a great product for removing gunk off of surfaces and moving mechanical parts, so I thought it would be perfect for the job. As I walked back outside with it, I looked at my beautiful car glistening in the sun. Her black paint was lustrous and flawless, except for the smudge on the driver’s side, of course. I paused for a second and doubted the man who had just helped me inside the store. Would the WD-40 ruin or fade my paint at all? He smiled at me and took the time to explain why and how WD-40 is safe for use on car paint. WD-40’s formula is actually a trade secret, but, to put it simply, it’s basically a unique blend of lubricants. The “WD” stands for “water displacement,” which is appropriate as one of its main functions is to displace moisture. He also explained that the formula contains penetrating oil and anti-corrosion agents. The way the formula works is that after application, the non-volatile, and viscous oil stays on the surface of whatever you applied it to. Because the oil is diluted with the hydrocarbon aerosol, it is able to finds its way through cracks and small crevices. Once the hydrocarbon evaporates, the oil is left behind, acting as a lubricant and corrosion preventative. In fact, WD-40 can be applied to protect car paint, and other parts of the car. Because the product removes moisture from the surface it is applied to and has an anti-corrosion agent, it will prevent damage to the surface done by those chemical processes. As an added bonus, this stuff can also be used to remove scuffmarks and bird droppings, any sticky drips from food on my leather seats, and can be used to shine my tires too. The uses for WD-40 were endless, and the more that the employee told me, the more I was becoming a little grateful that this kid had wiped his gooey little hand down the side of my driver’s side. I was a little more at ease about the threat of rogue shopping carts, birds overhead, and the off chance that I would have gum stuck to a part of me while getting into my car and engraving itself onto the leather. Maybe I didn’t need the $29.99 per month unlimited car washes now that I had this hard-working spray can. Seems ridiculous, but as I said before, my car was my baby. In case you were wondering, I did buy a second can of WD-40, just in case. To answer my original, pressing questions, WD-40 will not damage car paint. 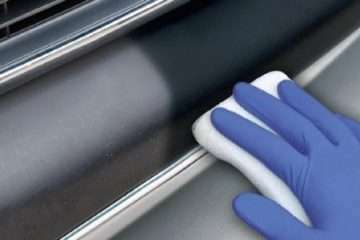 It will safely remove whatever needs to be removed, and will protect the surface it is applied to from fading and corrosion. That’s definitely a win-win. Will I voluntarily park my BMW underneath a tree if there are other options? Nope. But I have no fear of sticky fingers anymore. Are radar detectors legal in New Jersey?